One way you can make a positive impact on your life is to improve your home. A 2009 study from the Personal and Social Psychology Bulletin reveals that a cluttered home full of unfinished projects increases one’s stress level. The bathroom is an area of the home that is most used and may present the biggest stress. If you’ve been dreaming about a bathroom configuration that better fits your family, a bathroom remodel can bring enjoyment, efficiency and increase the value of your home. The design professionals at Republic West Remodeling can help you find the solutions that will meet your own unique needs. 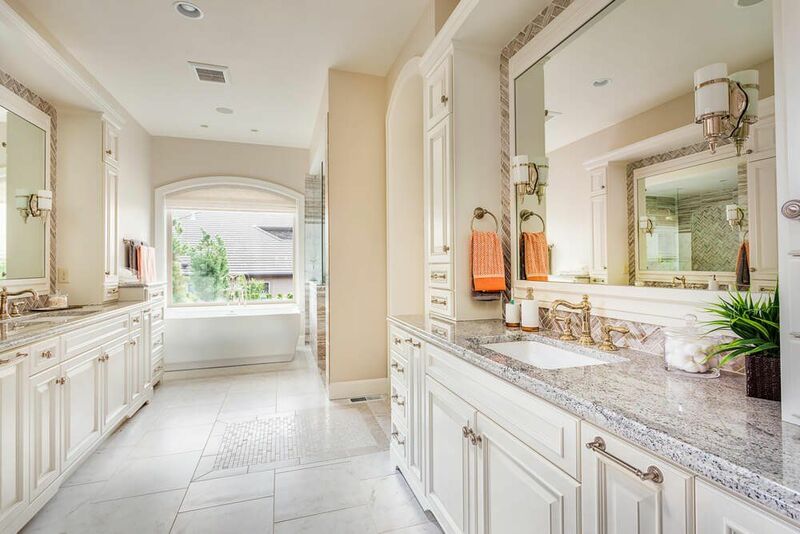 The ideal bathroom remodel should satisfy two areas: your personal needs and your home’s value. Overall, you want to take your bathroom a step up and not just make general repairs. For remodeling ideas, simply write down a list of things that “annoy” you about your bathroom when you use it. This wish list can be composed of both big and small issues. It should include all family members. Maybe your toilet uses an inordinate amount of water per flush, or you may have a leaky faucet, insufficient storage, or sliding doors to a shower that jam or harbor mold. These issues are important to resolve so that your bathroom can function properly and be a great place for self-care. Your bathroom designer will take this list of “musts” and make a master plan on how to resolve them. Natural Stone Countertops – Getting a high-value countertop that has a timeless appeal makes it easy to switch up your indoor decor as your tastes change. New Flooring – Cracked tiles and slippery floors pose major safety risks in older bathrooms. Update to slip-resistant natural wood or tile floors for an attractive and safe bathroom surface. New Sink and Faucet – Outdated sinks and leaky faucets need to make way for functional and beautiful modern replacements. New Cabinetry with Extra Storage – Modern storage presents creative solutions that weren’t around even a few years ago. Let our designers show you what bathroom storage can handle in this year. New Toilet – One that is up to modern water conservation standards will save you water and be good for the planet as well. New Windows – You can add new windows or enlarge a current window or skylight to let in more beautiful natural sunlight. Installing an Exhaust Fan – If your bathroom doesn’t have one already, this is a must to keep moisture and odors at bay. New Tub or Shower – A floor-to-ceiling steam shower is quite on trend this year and gaining popularity over traditional tubs. New Tile – Whether you want colorful painted tiles or faux stone in your shower, backsplashes turn an ordinary wall into a work of art. 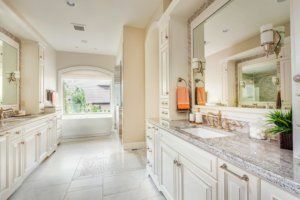 Since large-scale remodels like bathrooms tend to be done once every 10 years or more, it’s important to have a long-term scope to the design results. Leaning toward traditional and classic looks that incorporate natural tones and materials is a safer route than going for a full stainless steel “Jetsons” setup unless that fits your decor. It’s also important to mention that if you have just one bathroom in the home, it’s preferable to add a second bathroom than to have one incredible bathroom. In fact, according to the National Association of Realtors, adding a second bathroom can increase your home’s value by at least 8% in most markets. The upgrades you make depend on your budget and what you and your designer think would compliment your new bathroom. When you work with Republic West Remodeling, we offer the Dream Assurance Plan. We are committed to delivering an experience you can trust and delivers the results you’ve been dreaming about. We’ll meet with you to discuss everything you want to remodel in your bathroom and come back to you with a 3D rendering of the project before we even start. We listen and create based on what will work for your family. Learn more about the process and our commitments to you. For an enjoyable bathroom remodeling experience, contact us at Republic West Remodeling!